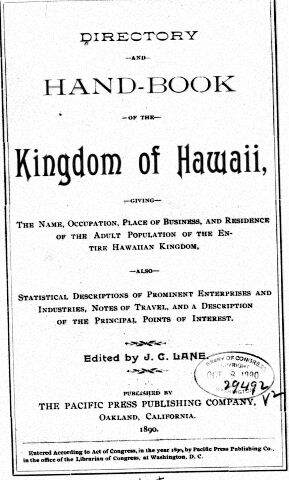 I have had the chance to view the “Directory and Handbook of the Kingdom of Hawaii” for 1890. 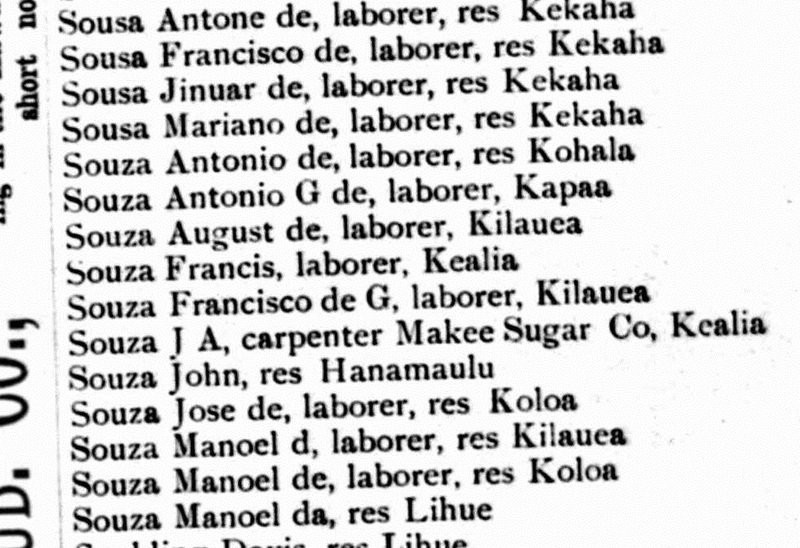 This is an important resource for Hawaii genealogists as it one of the first to include sugar plantation laborers. It is available online though the University of Hawaii at Mano’a website. It is in PDF format and can be found under the title “1890: Directory and Handbook of the Kingdom of Hawaii“. If you have access to Ancestry.com, you will find the directory under the U.S. City Directories (beta) collection found on the Search page. Curiously, Ancestry.com has it listed as “Honolulu, Hawaii, City Directory, 1890”. Don’t be fooled! It covers all the Hawaiian Islands. Ancestry.com has the several Hawaiian city directories. The earliest ones are 1869, 1884, and then 1890. I checked the 1884 edition to see if laborers are listed, but found very few people with Portuguese names. Hopefully, the volumes in between will become available and we can see if any of them are beneficial to Portuguese Hawaiian genealogists. The title page states that it is a directory of adults residing on all islands. As it includes plantation laborers, this makes it a valuable resource for those trying to find pre-1900 records. The word “adults” is a bit misleading. If there are females listed, I did not see them. Perhaps they are hiding behind the entries with only a first initial. Also, what age they determined to be an adult is up for grabs. Today, that might be 18 or 21 depending on the situation. However, I had little luck finding unmarried men. I should point out that I was looking primarily for laborers. It may be that for businessmen or non-immigrants, they listed all males over 18 or 21, whatever the case may be. This is an example of what typical entries look like in the directory. This is the section for Sousa and Souza. They include name, occupation, and residency. Some give a place of employment, but most do not. I am particularly interested in the three from Kilauea. I already know that August de Souza is related. I found this city directory useful. It is a transition document. It fills the gap between immigration in the 1880s and the 1900 US Federal Census when our ancestors were still adapting to their new home. It also shows our Portuguese ancestors with the Portuguese spellings of their names in most cases. This is interesting to me. It means that for at least a decade after the first wave of Azoreans and Madeirans arrived in Hawaii they were still using the Portuguese spelling of their names. This is especially noted for first names. Manoel is spelled with the “o”. Joao is used, not John. Francisco is used, not Frank. Jose is used, not Joe or Joseph. The only name I found variants for was Antonio which was shorted to Anton in some cases. This was probably due to space limitations more than anything else. This tells us something about the people and assimilations. It probably wasn’t until 1900 or the period between 1900 and 1910 when they began to use the anglicized versions. Most likely it was the children of immigrants who preferred the anglicized versions of their names. For my own family, it gives me a guidepost as to when surname changes occurred. Cosme Jacinto da Camara is listed under Jacintho with his first name spelled Casma. In just a couple of years the family would start using Cosma and Cosmer, but the change hasn’t happened yet. Same for my de Braga’s. They are listed as Braga, but by 1910, they were going by DeBraga. These are the entries for Jacintho. Notice the three different spellings. Check for variant spellings. I saw Medeiros, Madeiros, Maderos. If you don’t find your ancestors on the island that they lived on in the 1900 Census, check other islands. Contract laborers sometimes started on one island and moved to another. They also started on one plantation, fulfilled their contract, then moved to another. If you are dealing with a common given name and surname, don’t assume that the person listed is yours. Use several sources especially if this same name is in the wrong town. Make sure to find documents to prove or disprove the information. If you aren’t quite sure if you’ve found your person, search multiple city directories. If they stayed in one place, you should find them with the same residence information. As sons came of age, they should be found with their parents in later editions. If the person came over with their parents, you should see the patriarch’s name listed in earlier editions. City directories can offer clues between census years. Don’t pass them over. You might be missing important details about your family. For more on researching city directories, read my article “How to Use City Directories to Determine the Plantation Your Ancestor Worked for in Hawaii”.